The light will turn on and off according to the switch position. The light stays off at all times. 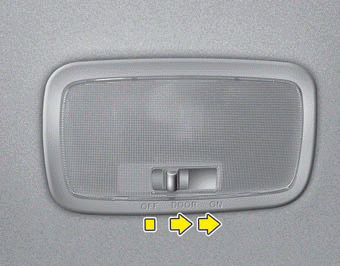 The light comes on when any door (or tailgate) is opened regardless of the ignition switch position. When doors are unlocked by the transmitter or the key is removed from the ignition switch, the light comes on for approximately 30 seconds as long as any door is not opened. The light goes out gradually after approximately 30 seconds if the door is closed. The light stays on at all times. Do not leave the lamp switches on for an extended period of time when the vehicle is not running.